1 Squeeze 1 teaspoon (5 mL) juice from 1 lemon half. Slice remaining half and set aside. 2 Preheat oven to 425`F (220 C). Combine crab, Hellmann's® Real Mayonnaise and Parmesan cheese in small bowl; set aside. Melt margarine in microwave-safe bowl; whisk in crumbled Knorr® Vegetable Bouillon Cube until dissolved. 3 Place salmon in shallow baking dish or in bottom of broiler pan. Brush salmon with 1 teaspoon (5 mL) Bouillon mixture, then top with crab mixture. Combine remaining bouillon mixture with 1 teaspoon (5 mL) lemon juice and toss with zucchini. 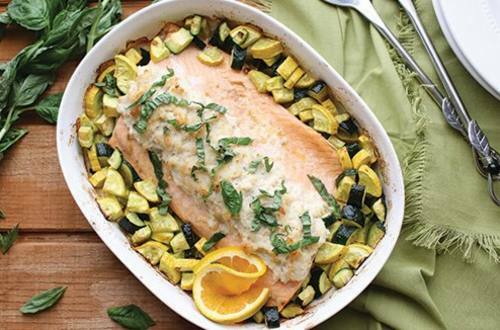 Place in baking dish around salmon. 4 Bake 25 to 30 minutes until salmon flakes with a fork. Garnish with sliced lemon and basil.